Magic is in the air when Allie and Jay Cameron visit their ancestors’ ancient Castle Keep in Scotland, tucked in its unspoiled loch. The twins wake the mischievous shape-shifting Boggart and his infamous cousin Nessie, of Loch Ness fame. But a summer of fun-loving trickery with the Old Things is invaded by a dangerous real estate developer called William Trout. In a race against time, the Boggarts recruit help from other Old Things of Scotland: hair-raising creatures of the Wild Magic. But are the Blue Men of the Minch and the Nuckelavee too terrifying for humans to handle? How can they drive out the invader? What’s certain is that Mr. Trout is in for a wild ride in this comical, page-turning adventure from Newbery Medalist Susan Cooper. "[T]he generations of family members and the timeless Scottish spirits are portrayed with finesse...The setting makes a powerful background, and its heritage and folklore provide story elements that are interwoven with modern-day reality in an unusually seamless fashion. 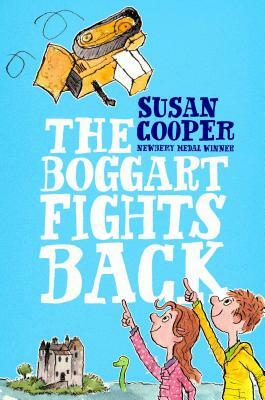 A welcome addition to the Boggart series." "Cooper deftly weaves ancient Scottish lore into an imaginative contemporary tale with an ecological twist, while the Boggart remains as comical, fey, unpredictable, and thoroughly entertaining as ever...The Boggart is back to delight a new generation." "Once again, Cooper cleverly combines European folklore with modern storytelling as she satirizes materialism and contemporary politics." "Cooper’s well-crafted prose and pacing will engage readers, who will thrill to the cast of 'Old Things' they meet."